Army Spc. 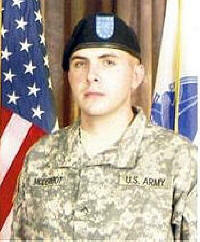 Ryan J. McDermot - Run for the Fallen New Hampshire, Inc.
26, of Hampton, NH; died unexpectedly of natural causes at Fort Hood, TX. Ryan was born in Portsmouth, son to Jeffrey and Donna McDermot. He was raised in Hampton, where he graduated from Winnacunnet High School with the class of 2005. Ryan enlisted in the Army in 2010, where he proudly served honorably for the next three and half years with Charlie Company in the 2nd Battalion at Fort Hood. He served one tour in Afghanistan. Ryan was an avid Patriots and Red Sox fan who enjoyed snowboarding and the outdoors. He was also an accomplished scuba diver, who was very proud to serve our county in the Army. Most of all Ryan loved spending time with his family and friends, where he always had this uncanny way with words and one-liners that would leave you in tears from laughing. Family and friends remember Ryan's passion for life and to be the best soldier he could be was what he strived for. Ryan's awards and decorations include an Army Achievement Medal, National Defense Service Medal, Afghanistan Campaign Medal with two Campaign Stars, Global War on Terrorism Service Medal, Army Service Ribbon, Overseas Service Ribbon, and NATO Medal. Ryan is survived by his parents Jeffry and Donna McDermot, sister Lisa and husband Michael and niece Evangelina, grandparents Caryl E. Taylor and James W. McDermot, his girlfriend Alexis Cross, and their dog Gino and his extended family.